When the original version of Home Truths appeared in 2006, it was already an accomplished work of great technical sophistication and emotional insight. This expanded and extensively revised edition manages to substantially improve upon the earlier book, drawing on recently-discovered source materials to clarify and deepen the complex and emotionally charged narrative of the author’s parents’ courtship in Dayton in the 1950s—a story of often short-lived triumphs and sometimes lingering disappointments—centered around the formidable figure of the poet’s maternal grandmother, a matriarch who did whatever she had to, to ensure that the family business, a funeral home, would continue to prosper after her husband’s sudden and unexpected death. Mixing personal recollection with a wealth of reconstructed correspondence, Ryan Guth displays an enviable facility with both poetry and prose; while the majority of the verse pieces presented are scored as free verse, the sequence also contains one extraordinary sonnet. from the look of him. then turned back to her program. out to St. Elizabeth’s and back. put a radio in a goddam hearse? Here, and elsewhere, the delicate balance between the heartrending and the genuinely funny serves to heighten our sense of the elegiac, of a nostalgia for a time and place that remain compelling despite the overwhelming presence of loss. The poet clearly loves and honors his family—warts and all—without ever losing sight of the quiet tragedy that infuses everyday life. The result is both a tribute and a coming-to-terms; over the course of these 31 poems and prose pieces, long-silent voices request, and receive, a kind of absolution. Throughout, the vernacular of 1950s Ohio is pitch-perfect, and his characters and situations are so deftly drawn that authenticity sings in every line. 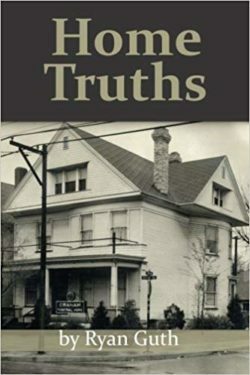 Whether the reader chooses to approach the work as a series of interdependent poems and prose poems, or as a single, sustained poetic memoir, Home Truths resonates with humanity, pathos, and occasional flashes of humor, made all the more poignant by its exceptional range. Here is a remarkable achievement, a book to reread and remember, and one of which the author’s novelist father would surely have been proud. Robert Lavett Smith is the author of four collections of poems. He lives in San Francisco. Read other articles by Robert Lavett. This article was posted on Thursday, July 12th, 2018 at 3:52pm and is filed under Book Review.